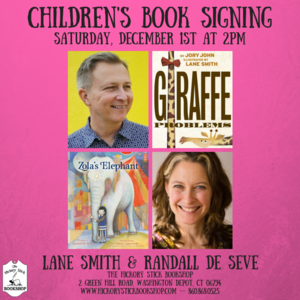 Children's author/illustrator Lane Smith and author Randall de Seve will sign their books at The Hickory Stick Bookshop on Saturday, December 1 at 2 p.m. Lane Smith's latest book is Giraffe Problems, the sequel to Penguin Problems, both written by Jory John. Randall de Seve's latest book is Zola's Elephant, illustrated by Pamela Zagarenski. About Giraffe Problems: Can you guess what's making this giraffe self-conscious? Could it be . . . HIS ENORMOUS NECK?? Yes, it's exactly that--how on earth did you figure it out? "Never one to let an opportunity for caricature go to waste, Smith stretches Edward’s neck to comical length... That it’s just right for a giraffe is a notion that Edward, not to mention young readers with self-consciousness issues of their own, will have no trouble swallowing," says Booklist in itsstarred review. Lane Smith (also the illustrator of Penguin Problems) has written and illustrated a bunch of stuff, including Grandpa Green, which was a 2012 Caldecott Honor Book; It's a Book, which has been translated into over 25 languages; and The True Story of the Three Little Pigs! Four of his books have been New York Times Best Illustrated Children's Books of the Year. In 2012 the Eric Carle Museum named him an Honor Artist for "lifelong innovation in the field of children's books." In 2014 he received the Society of Illustrators Lifetime Achievement Award. Lane and book designer Molly Leach live in rural Connecticut. Visit him on the Web at lanesmithbooks.com. About Zola's Elephant: Illustrated by two-time Caldecott-honor winning artist Pamela Zagarenski, this tender, witty friendship story of imagination gone wild, by New York Times bestselling author Randall de Sève, shows how assumptions often cause us to misjudge—and miss out. But with a little courage, new opportunities and new friendships can be made. In a starred review, School Library Journal says, "Zagarenski’s textured and detailed illustrations will capture children’s imaginations, and will have them enthralled as they follow the many smaller animal familiars through the pages. A must-purchase." Randall de Sève is the author of New York Times bestseller Toy Boat, The Duchess of Whimsy, Mathilda and the Orange Balloon, Peanut and Fifi Have a Ball, and A Fire Truck Named Red. Randall spent many fun-filled years teaching young children at Saint Ann's School in Brooklyn, NY, where she now lives with her husband, two daughters, a very wicked dog named Henry Biscuit and his feline archnemesis, Cleopatra. She also contributes to Redbook Magazine online. Visit her online at randalldeseve.com. This event is free and open to the public. If you are unable to attend this event, you may reserve a signed copy of Giraffe Problems and/or Zola’s Elephant by calling The Hickory Stick Bookshop at (860) 868 0525.